To disassemble a faucet, begin by moving the trims—then follow the diagrams below. 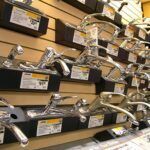 Expert advice on how to take apart bathroom faucets, with illustrated diagrams of how a compression, ceramic-disc, ball and cartridge faucet works. First turn off the water supply valves under the sink and place a towel in the sink to prevent scratches and to catch any dropped parts. Then remove the handle. 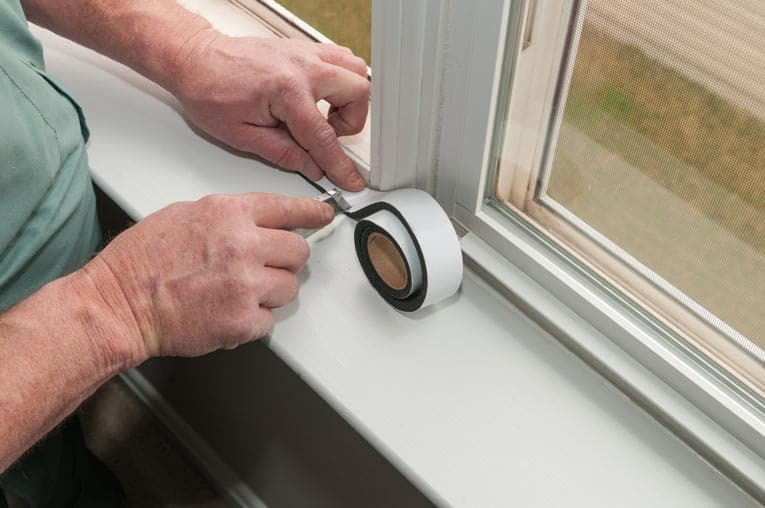 To do this, use a small, flat screwdriver to pry up the decorative cap, button, or plug at the top of the handle, used to hide a screw. Then unscrew the screw and pull or pry off the faucet. Lay out the parts in order as you remove them so you won’t have trouble re-assembling the faucet. And be sure to note the manufacturer’s name on the faucet (if you can find it) and take the old parts with you when you go to buy replacements. 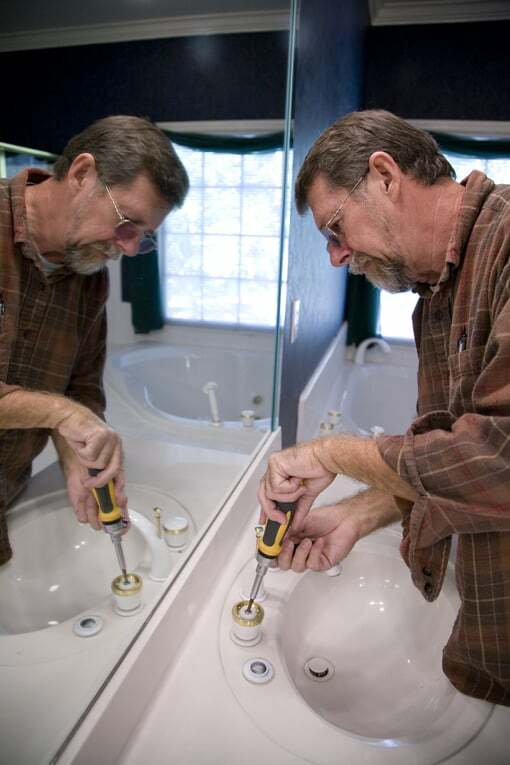 Unscrew the bonnet from the faucet base, using slip-joint pliers. Then remove the valve stem; this has reverse threads, so unscrew it by turning it clockwise. Once you have it out, replace all rubber washers and O-rings. For more, see How a Compression Faucet Works. 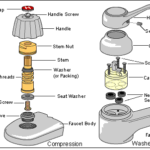 The type of faucet determines the methods of disassembly. 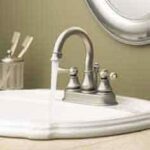 Most ceramic disc faucets don’t drip or leak because they’re made to be almost maintenance free. Two ceramic discs regulate the flow of water: a movable upper disc turns or lifts and lowers against a fixed lower ceramic disc. Though these faucets are washerless, they do have inlet and outlet seals that may leak, or sediment may build up inside the inlets and cause leaks. Be sure the faucet is in the “open” position when replacing seals. For more, see How a Ceramic Disc Faucet Works. Remove the decorative cap and screw to pull off the handle. To tighten the plastic adjusting ring inside the cap, you turn it with a special flat adjusting tool (or fit two screwdrivers into the slots and cross their blades to turn the ring. 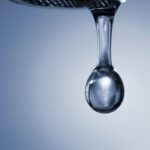 For a spout leak, unscrew the cap, using locking-jaw pliers (wrap the jaws with duct tape to prevent scratching the faucet’s finish). Lift out the ball, and replace the rubber seats and springs on both sides of the valve. If the faucet leaks around the spout, replace worn O-rings. For more, see How Cartridge & Ball Faucets Work. Remove the decorative can and screw and pull off the handle. To release the cartridge, use a pair of pliers to pull the retainer clip straight out. Pull out the cartridge and replace the O-rings and seals to fix leaks. If the faucet drips, you may need to replace the entire cartridge. For more, see How Cartridge & Ball Faucets Work.